Row 1 (RS): P1, * k1, p1; rep from * to end. Row 2: K1, * p1, k1; rep from * to end. Row 3: K1, * p1, k1; rep from * to end. Row 4: P1, * k1, p1; rep from * to end. Repeat rows 1-4 twice more for a total of 12 rows. 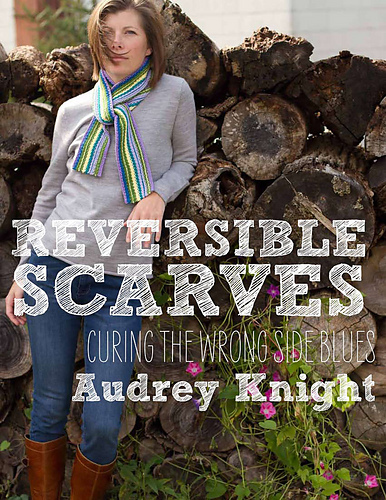 Here’s a short scarf that pulls through a split slot to form a sweet accent. 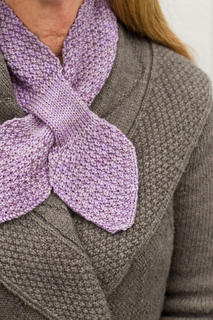 Easy to make, this is the perfect pattern for gift giving. And using just one 225-yard skein, it’s a great use of that special hand-dyed, nearly-solid yarn that’s been hibernating in your stash.